If the information coming from Rivers State is true, then the step mother of Nigeria’s First Lady Dame Patience Jonathan has died. Mrs Iwarioba popularly called Sisi by the First Lady died yesterday in Elele area of Rivers State on her way to Bayelsa state. 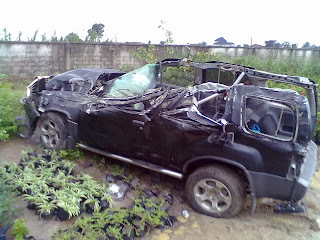 The road crash that killed Patience Jonathan’s step mom happened around 4pm on Monday July 22th, 2013 in the aforementioned area of Rivers State. A reliable source said that the body of the deceased has been moved to Kpaima Mortuary on Elechi Beach, Mile One, Diobu, Port Harcourt, the Rivers State capital, around 6 pm, by the self-acclaimed “Speaker” of Rivers House of Assembly, Evans Bipi, accompanied by many policemen. Bipi, who represents Ogu/Bolo Constituency, is a former aide to the First Lady, who attended his marriage on June 15 at the St. Cyprian’s Anglican Church, Hospital Road, Port Harcourt, shortly after which she buried her grandfather at Okrika, during her 10-day visit to Rivers State. 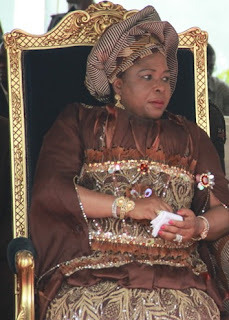 Dame Patience, an indigene of Okrika, the headquarters of Okrika Local Government Area in Rivers State is in Geneva, Switzerland, according to sources who said she was immediately contacted. Mrs. Jonathan expressed shock and she felt very bad over her step mother’s death, according to a family source, who pleaded not to be named. Details of the accident were sketchy last night, but a security man at the gate of the Kpaima Mortuary, who declined to give his name, said many armed policemen accompanied a body to the private facility, presuming that the deceased might be a prominent person. The Rivers Sector Commander of the Federal Road Safety Commission (FRSC), Dr. Kayode Olagunju, and the Rivers police spokesperson, Mrs. Angela Agabe, could not confirm the incident, stressing that they were yet to get the details from their officers and men at the scene of the accident. A source said last night that the late Mrs Iwarioba was Patience Jonathan’s stepmother, but this could not be immediately confirmed.